Last Friday I came across this device in the men’s room at UTS. A shiny new hand drier, with an LCD screen. 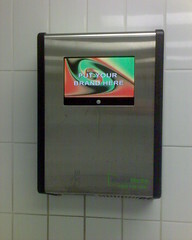 As you stand to dry your hands advertisements are displayed (along with tinny music). Is the uni finding itself so low on money that it needs to display adverts in the toilets?